As the malleable and clichéd pub saying goes: buying a home is the next most stressful thing after X – where X is the most stressful common thing you can conjure up after a glass or two, so normally divorce. Well, if buying a home is so stressful, where on the stress scale is building your own home before you move into it? You’d imagine it to be more stressful than simply buying a home. So, pretty stressful. Despite all this, it seems there were 13,000 self-build projects completed in the UK in the past financial year. That, at least, is the figure provided by the recently released, fact-packed Self & Custom Build Market Report 2017, published by the people behind Homebuilding & Renovating magazine. What’s more, according to the detailed survey conducted for the report, a sizeable slice of these self-builders would do it all again. Not that self-build means laying every brick and hammering in every nail. The level of design and construction commissioned by self-builders varies widely. As the report points out: ‘Self-build covers a wide range of different build routes from DIY self-build… to those using a main contractor.’ And it bumps up to custom-build where someone who commissions a specialist developer to help to deliver their own home. While the UK ranks low internationally when it comes to the proportion of homes delivered through custom and self-build, there is clearly a strong appetite among the public. And, with the noises coming out of Westminster, it is clearly an appetite that many politicians of all stripes would like to see better satisfied. They will no doubt be delighted that, as recently launched schemes to boost the number of individually commissioned or built homes are kicking in, the numbers engaging in self-build are on the rise. As Chart 1 shows, having plunged by 30% in the recession, the number of self-builds is now displaying strong growth. The lack of mortgage funding caused by the credit crunch and the general wariness with the housing market will have been factors in curbing enthusiasm. But on this point, one finding in the survey is well worth noting. More than half of self-builds are funded through savings. Much, if not most, of this will be from the equity gained over many years from owning a home. This provides, in part, some explanation for why a recovery in the self-build market might tend to lag the general rise in the market. Many self-builders will be looking for a strong market into which they are happy to sell their existing home. This also suggests much about the type of people we might expect to see engaging in self-build projects and, to a lesser degree, where they are more likely to build. As the survey suggests, if you wanted to find a self-builder you would be well advised to look for a person in their late 50s or early 60s (the ones most likely to have a large slice of housing equity) and probably you’d look to the South West of England where plenty seek their later-life idyll and fulfil long-cherished dreams. That said, while the South West is a big market for self-building, the figures presented in the report show that – relative to the number of households and to the number of homes built each year – the top spot for UK self-build and custom-build actually goes to Northern Ireland. Here, these closely linked markets currently account for more than 16% of new homes built. This compares with just over 8% for Scotland, just under 8% in Wales and below 7% in England. This level of custom and self-build makes the UK extraordinary when compared with most other similarly developed nations, where the market share is considerably higher. In some countries, such as Austria, Germany, Italy and Belgium, the share is more than 50%. Mind you, the immediate future in the UK does look pretty rosy. The report shows planning applications for single new dwellings up solidly across all regions in 2016 compared with 2015. And the National Custom & Self Build Association has bullish estimates that the sector will reach 20,000 new homes by 2021 and 50,000-60,000 new homes by 2030. This optimism may seem rather, well, optimistic, but its foundation is a hefty legislative shot in the arm for the sector, which now enjoys wide political support with all parties keen to see more homes built in addition to those supplied by major housebuilders. 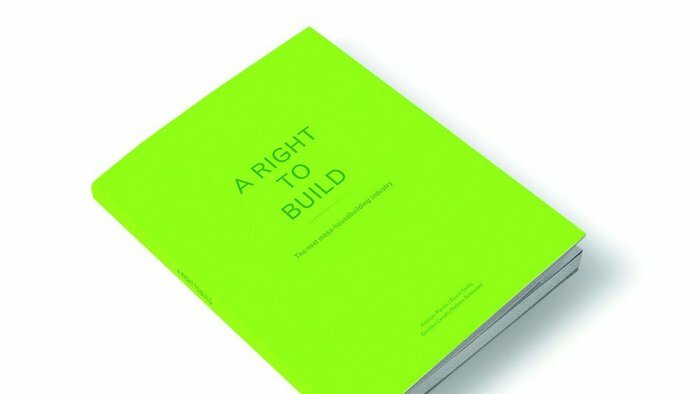 Various supportive legislation is, in many ways, crystallised in ‘Right to Build’. This places a duty on local planning authorities in England to assess the demand for custom and self-build and to provide enough serviced land to provide for that demand. While the optimism has yet to be realised and its eventual impact remains uncertain, the runes do suggest a potentially healthy expansion of a market that should be viewed by architects extremely favourably. What architect isn’t turned on by the thought of a commission to design from scratch a new home within its unique setting? Putting that romantic notion into the rude context of reality, as things stand, while self-build does provide a reasonable slice of work for architects, the survey found almost a third of all self-builders (29%) design their own homes without the help of a professional. The number of ‘citizen architects’ appears to be large. Precise definitions may well get a bit muddled, but the proportion saying they used an ARB/RIBA architect as the primary designer was 36%, with the remainder – roughly another third – using professional designers who are members of RICS or CIAT or completely unaffiliated — including in-house designers at package companies. Another item worth noting is that the survey found that, in style, ‘modern’ homes were more favoured by the self-builders than ‘traditional’ homes, by about a third. But perhaps more interesting to architects, of those where qualified architects were commissioned, almost twice as many of the homes were described as modern rather than traditional in style. Chart 2: Self-build homes, modern or traditional in style? An intriguing quirk too was that in areas where getting planning tends to be trickier – South East England, for example – there was a greater tendency than elsewhere to go for more traditional-styled homes (see Chart 2 above). Whether this is a sign of pragmatic responses of self-censorship in anticipation of rows with planners or an issue of taste is a moot point. How the positive legislation and incentives will shape the attitudes of local authorities and their planners, and how it will impact on the market, is yet to be seen. One crucial test of its wider success will be how the engagement with self-building filters further down the income scale. One clear message from the survey is that currently self-build is the domain of those with either relatively high income or significant wealth. Most self-builders would slide easily into the upper quartile on household income. Meanwhile, a fair slice of the relatively few on lower incomes tend to be of retirement age and so, while their income may be lower, they are likely to have benefited from growth in housing wealth over the years. The report found that comparing the age profile of self-builder in its survey with a similar study a decade ago suggests that the average age of a self-builder has risen five years over that period. This tends to lend weight to the idea that housing wealth is a key driver of the market. The generation in their 50s and 60s now are frequently referred to as the ‘lucky generation’ which has acquired lots of housing equity through the relative leap in real house prices. From Chart 3 we can clearly see that generation shifting through. The peak now is with those in their 50s with a very strong showing among 40 and 60 year olds. Ten years ago that peak was in its 40s, with the 30 and 50-somethings well represented. For custom and self-build to be sustainable in the long term, it will need to provide options that don’t rest on accumulated housing wealth. No doubt, here, architects can play a role. From a marketing point of view there are plenty of ways architects might view these snippets of information. The more positive view would be to see the potential in the market. Not only does it appear to offer significant expansion as a market, but there is plenty of scope for architects to expand their share within the custom and self-build market above the roughly one-third they currently seem to enjoy. What makes the perfect self-build?